We get calls every day about people wanting to order custom sized bags. Congrats! These bags will be made specifically for your products and are a wonderful way to market your product. However, ordering the right bags means thinking about a few features of the bag. These main features are dimensions, side seals, zippers, hang holes, tear notches, and gussets. • First of all, we do all of our dimensions in inches. • They are all outer dimensions (entire bag left to right, up and down) NOT interior dimensions. • Dimensions are always width x length. If you call saying “I want a 4 x 8 bag” we are going to assume you want a bag 4 inches wide and 8 inches long. Going from there, we’ll ask you what you are putting in the bag. If you say “I’m putting my 4×8 inch medical health bar in there” we are going to stop you right there and talk about side seals. 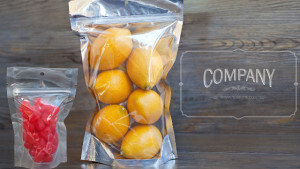 One of the major differences between inexpensive bags with thin, junky seals that blow out and multi-layer barrier packaging is the seals on the sides and bottom of the bag. These Teflon-coated seals help to maintain the important barrier properties our customers want. The thinnest seal we can do is ¼ inch, but we typically do 3/8 of an inch. That means you’ll have almost ½ inches on sides and perhaps bottom seals that could eat into your interior bag space. So if you are putting a 4×8 health bar in each bag, you’ll definitely want a 5-6 x 9-10 inch bag! Many of our clients put zippers at the top of their bags if they want end users to be able to eat or use their product over time. However, a zipper needs a lip above it. A lip is where the user can grab the material at the top of the bag and pull apart the bag. We usually recommend 1 to 1.5 inches of top lip on a zipper to allow a good hold, and that spacing gives room for hang holes and tear notches, discussed below. NOTE: If you’re adding a zipper, you’ll need to consider increasing the overall length of your bag. Do you want your product to be able to be hung on a wall? If so, you’ll need extra lip at the top of the bag to account for a hang hole. Hang holes don’t cost extra to produce, but they can take up valuable real estate on the bag. This is another thing to consider. For many cannabis folks, they don’t want tear notches as it makes it easier for end users (particularly children) to open the bag. Again, no extra cost to have them or not have them, and it’s not really a real estate issue because tear notches are tiny, but it’s something to consider regarding what type of product you are packaging. 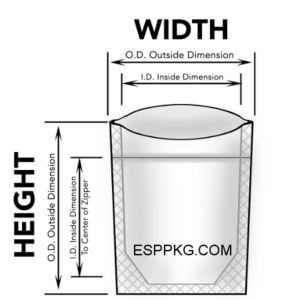 A gusset at the bottom of a bag converts it into a 2 or 3 seal lay flat bag/pouch into a stand up pouch (SUP). 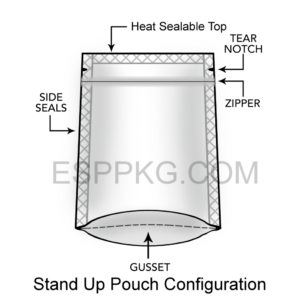 Gussets come in various sizes and allow more volume of product to be placed in the bag. They are also a more complex bag, making them more expensive overall than lay flat bags.